Work related ill-health can happen in any business, whatever its size. Unlike work injuries, ill-health problems may go unnoticed. They can slowly become worse until the illness becomes permanent and possibly disabling. You cannot afford to ignore the business costs that ill-health may cause. Workstation assessments concentrate on the core issues relating to working at a desk with computer and will cover all of the main issues such as posture, support & repetitive activities. Our assessor will observe how the user sits and works and will advise the individual on how to reduce and eliminate pain and increase comfort and productivity. 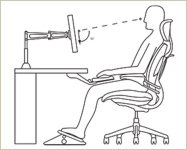 Any actions required by the user (posture, how to operate the chair etc) or your organisation (i.e. a footrest is needed) will be documented on an action sheet. The duration of a workstation assessment is approx 15 – 20 minutes per user; dependent on the complexity of the issues. The completed action sheets are handed over to the relevant person within your organisation. The above activity could be carried out within one working day. Naturally if you require a tailored program of assessments we can arrange for our DSE assessor to visit you and create either an ongoing program or a schedule of dates for activity. The most cost effective way is for the full day group activity as described above. If you have used our workplace assessment program we also provide additional discounts on any ergonomic based products you subsequently buy or lease. All consultancy work will be undertaken by our qualified CIEH assessor (Chartered Institute of Environmental Health) who is fully covered for Professional Indemnity. Acting now with help prevent days lost through back pain and stress and also reduce the liklihood of your company having legal action taken by employees as a result of their suffering from work-related ill health.